In many ways, life on Earth as we know it depends on ice. It provides most of the world’s fresh water supply, keeps global sea levels from rising disastrously and gives us vital data about past and future climate. Here are a few more intriguing facts about ice, both on our planet and beyond. 1. THE CRYOSPHERE IS WHAT WE CALL ICE ON EARTH. Later we’ll talk about ice on other planets. But if we want to talk about ice on Earth, that’s the cryosphere—the NOAA breaks it down as the “frozen water part of the Earth system.” Cryo comes from the Greek for cold, “kryos.” It includes not only all types of frozen water, but permafrost, which is soil that has existed below freezing for extended periods of time, but doesn’t necessarily have any water. 2. WATER IS USUALLY MORE DENSE THAN ICE. Ice and liquid water may be made of the same stuff, but those molecules arrange themselves in different ways depending on whether they’re in a liquid or solid state. In liquid water, molecules are able to fill in gaps and pack themselves in more closely than in the spread out and ordered crystalline structure of ice, which makes ice less dense and therefore able to float on water. At least that’s what usually happens. Heavy water ice (where the hydrogen atoms have a proton and a neutron, as opposed to just the proton in normal hydrogen) does sink. That may happen because the water molecules themselves become heavier thanks to the heavier hydrogen atoms, and the hydrogens form stronger bonds. 3. THERE ARE A LOT OF DIFFERENT NAMES FOR ICE. Sea ice alone comes in myriad varieties, and Arctic and Antarctic sea ice have their own distinct vocabularies. Brash, frazil, nilas, and pancake ice are a few of the varieties found in both. If you’re ever navigating near the poles, you’d better be able to distinguish an iceberg from an icefoot, a bummock from a hummock, and a floe from a floeberg. But if you think that’s a lot to remember, the Inupiaq of Alaska have 100 names for ice—which makes sense for a people whose survival requires expert knowledge of the characteristics and behavior of frozen water in all its variations. Of course, linguistically, it’s not quite that simple; their language is polysynthetic, meaning that words are formed by combining roots and endings to form countless words. Moreover, some words do double duty; a mapsa, for instance, is both an overhanging ledge of snow and a human spleen, which “overhangs” other organs, as far as Inupiaq see it. Nevertheless, that’s a lot of nuance for a substance we usually refer to with a single term. 4. ICE STORMS HAPPEN WHEN SNOW PASSES THROUGH WARM AND COLD LAYERS IN THE ATMOSPHERE. Ice storms can be deadly. Here’s how they happen: Snow enters a warm layer of the atmosphere and melts into drops of rain, then passes through a cold layer of air. The rain drops don’t have time to refreeze as they fall through this thin cold layer. But when they finally hit a cold surface, they immediately turn to ice. The result is an especially thick, heavy coating of ice that turns sidewalks and roads into skating rinks, making driving and walking very dangerous. As ice thickens on power lines and trees, its weight can snap cables and damage branches, leading to widespread power outages and turning tree limbs into deadly falling objects. Now scientists are modeling how and where these storms are likely to strike in the future by simulating ice storms in New Hampshire research forest plots. 5. DRY ICE ISN'T MADE OF WATER. It’s frozen carbon dioxide, which can change from a solid to a gas at room temperature and pressure without going through a liquid state. Dry ice is quite useful in keeping things cold because it freezes at a chilling minus 109.3 degrees Fahrenheit. And of course, it’s also a great way to set the scene for spooky theatrical productions and haunted houses. 6. ICE PAVED THE WAY FOR MODERN REFRIGERATION. The use of ice for food preservation has been around for millennia. In the United States, people depended on a variety of methods to prevent food from spoiling, including canning, salting and drying. But the most effective method was to keep food cool with blocks of ice. In the early 1800s, ice harvesting as an industry took hold as horse-drawn ice cutters pulled thick blocks of ice from frozen lakes for use in insulated ice houses and cellars. By the late 19th century, household iceboxes, forerunners to the electric refrigerator, were common. Ice didn’t only provide convenience for individual homes. It was key to advancing mass production and distribution of meat and other perishables, which in turn supported urbanization and a variety of other industries. By the end of the century, however, pollution and sewage dumping had contaminated many natural ice supplies. This problem helped spur innovations that led to the modern electric refrigerator. While there were earlier versions in the 19th and early 20th centuries, GE’s Monitor-Top fridge, released in 1927, was the first to see widespread commercial success. 7. GREENLAND'S ICE SHEET CONTAINS 10 PERCENT OF THE WORLD'S GLACIAL ICE—AND IT'S MELTING FAST. The Greenland ice sheet’s melt rate is accelerating at a sobering rate: According to a study published earlier this year in the journal Nature Climate Change, the ice sheet now loses a mind-boggling 8000 tons per second. Scientists are studying Greenland’s ice sheet to document its past behavior in the hopes of better understanding how it may respond to climate change. 8. ICEBERGS AND GLACIERS DON'T JUST COME IN WHITE. White light is made up of a rainbow of colors and each has a different wavelength. As snow accumulates atop an iceberg, the air bubbles in the snow get compressed and more light penetrates the ice rather than getting reflected by bubbles and tiny ice crystals. And here’s where the magic happens: Longer color wavelengths, like red and yellow, get absorbed by the ice, while shorter wavelengths of color, like blue and green, reflect the light. That’s why icebergs and glaciers often appear blueish green. 9. THERE HAVE BEEN MANY ICE AGES ON EARTH. We tend to think of The Ice Age, as if there was just one. Actually, many others occurred before humans arrived on the scene, and they were often much more severe. At certain points the entire planet was likely frozen, something scientists call “Snowball Earth.” Some theorize that some ice ages were caused by the evolution of new life forms — plants as well as both unicellular and multi-celled organisms — which changed atmospheric carbon dioxide and oxygen concentrations in ways that altered the greenhouse effect. New Scientist has a nice recap of the history of ice on Earth. Earth will continue to cycle through periods of ice and warming. But the current predicted rate of warming for the next century is at least 20 times faster than past periods of warming, raising questions about how human-induced climate change will affect those natural cycles over the long term. 10. MORE THAN TWO-THIRDS OF EARTH'S FRESH WATER IS STORED IN GLACIERS. Melting glaciers aren’t just a problem for glaciers. 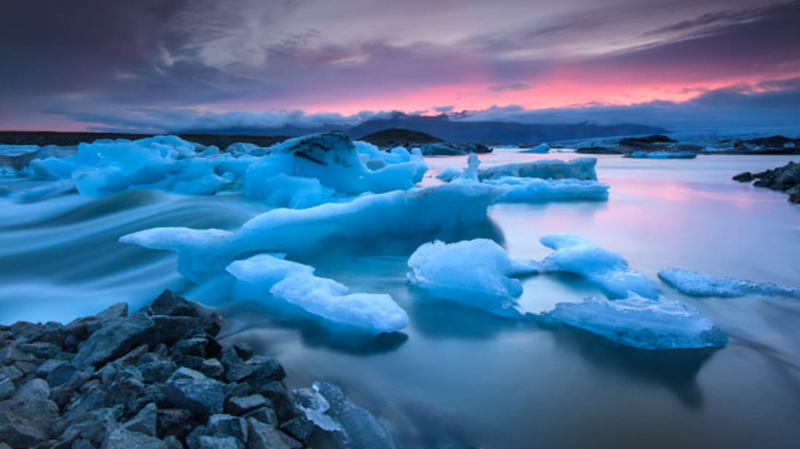 The loss of all that ice will affect the global water cycle and have a big impact on water supply and quality, energy generation and incidences of extreme weather. In some places, like the Andean region of South America and the Himalayas, those problems are already starting to be felt. 11. ICE DOESN'T ONLY EXIST ON EARTH. Hydrogen and oxygen, the building blocks of water, are plentiful in our solar system. But depending on their proximity to the Sun, different planets in the solar system have different amounts of water. Those furthest from the Sun, like Jupiter and Saturn, have much more water than those closer to the Sun, like Earth, Mercury and Mars, where high temperatures made it harder for hydrogen and oxygen to form water molecules. Those planets of the outer solar system have several icy moons. One of the most intriguing is Europa, which is covered by a layer of ice several kilometers thick. Its icy surface contains intricate patterns of cracks and ridges, likely caused by tides of its subsurface ocean. Europa’s abundant water has led scientists to speculate whether it might be capable of supporting life. 12. THERE'S SUCH A THING AS AN ICE VOLCANO. Enceladus, one of Saturn’s moons, has another curious feature. Its southern polar region contains “cryovolcanoes” —an exotic type of geyser thats spews ice instead of magma. It happens when ice deep below the surface gets heated and turned into a vapor that then erupts into the moon’s chilly atmosphere as ice particles. 13. ICE ON MARS COULD HOLD THE KEY TO LIFE ON THE PLANET. Satellites tell us that Mars stores its ice (both dry ice and frozen water) in polar ice caps, permafrost and on a handful of glaciers. And the Red Planet’s reserves of ice may hold clues to the long-debated question of whether it is capable of supporting life. Until recently, it was thought that the current extremely low temperatures and thin atmosphere of the planet prevented water from existing in its liquid state. But in 2015, NASA scientists reported compelling evidence that briny water is still present on Mars, at least occasionally. Where that water comes from remains a mystery, but one theory focuses on melting subsurface ice as the source. Could that limited amount of water sustain life under current planetary conditions? That’s something future missions to Mars will continue exploring. 14. ICE CORES TELL A FASCINATING HISTORY OF THE EARTH. Glaciers are a vast resource of information about conditions on Earth over hundreds of thousands of years. Climatologists drill cylinder-shaped samples of ice from glaciers and analyze the dust, minerals, ash, gas bubbles and human-made pollutants that have collected in snow for millennia. From this data, they can determine details about things as varied as forest fires, volcanic activity, sea ice extent, solar variability and atmospheric circulation, as well as anticipate future climatic conditions. The National Ice Core Laboratory alone has more than 70,000 ice samples to piece together a picture of the Earth over long periods of time. Want to explore for yourself? The World Data Center for Paleoclimatology maintains incredible archives of ice core data. 15. SOME OF THE BEST-PRESERVED MUMMIES WERE FROZEN. From the Andes to the Alps, frozen human remains allow us fascinating glimpses of how people lived hundreds and thousands of years ago. One of the most exquisitely well-preserved is the Incan teenager known as La Doncella, or the Maiden, who was left along with two younger children as religious offerings near the frigid summit of an Argentinian volcano more than 500 years ago. Another, much older specimen is Ötzi the Iceman, discovered in the Alps near the Austria-Italy border in 1991. For being a 5300-year-old corpse, Ötzi looks pretty darned good.